With Tools. With Technology. With Hope. "Hi - thank you for the awesome job you did with The Job Connection. Because of this ministry, I was able to secure a new job (I start next Tues!!). I wouldn't have found out about this position without your help." Great tools to support & manage your job ministry. We create a personalized Job Connection website just for your church, nonprofit or community organization. Help job seekers needing to improve their resume or create a new one. Fill-in boxes with guided descriptions help the job seeker create a dynamic and effective resume. Users take a simple 10 minute assessment and receive a complete picture of multiple potential careers that would best fit them. The Prayer Network is a powerful tool for your Ministry. Prayers are organically collected via the website and sent to the network to be prayed for. We help you manage the process of registering employers, accept online payments, finding available jobs, and creating simple registration and reporting. It takes 30 seconds a day to administer and run the entire Job Connection system! Fast and easy for organizations with little time. The Job Connection provides job seekers and employers 150+ career resources. We partner with Crossroads Career who has a proven 7-step Bible-based approach to help people find jobs, careers and God’s calling. Each day users can receive biblically-based career tips to help them in their job search, career and finding God’s calling for their life. Additional features include: Automatic Job Alerts, Direct Job Application, RSS Job Integration, Live Statistics, Email Manager and more! Unemployment is a Road. No one should go it alone. Work is Worship: We were designed for good works. Through work, our communities are redeemed and flourish. We don't just care about work. We care about the worker. Best-of-breed job search resources shared by ministries across the US. Deployed nationwide at Churches and Non-profits since 2003. Let us know what you want to call it. Create a link to your new site from your church's site. Tell your church about your new site! Get our FREE eBook on how to launch a Job Ministry in your church. Over 45 pages of helpful information and tips for starting a Job Ministry. 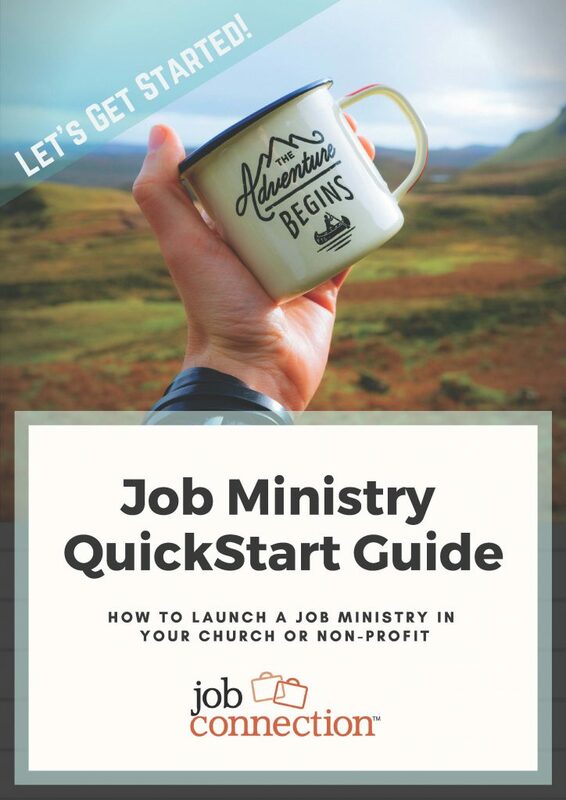 Get our eBook "Job Ministry QuickStart"
This eBook will give you all the basics to help you get your new job ministry started today!